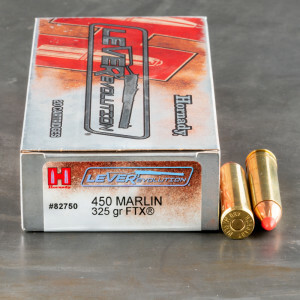 .450 Marlin ammunition is a centerfire, rimless, belted-magnum, straight-walled, .458 caliber, rifle cartridge originally developed by a joint team of Marlin and Hornaday engineers. Both companies introduced the cartridge in 2000 for use in the Marlin 1895M leaver action rifle. Devastating as a close range varmint load.